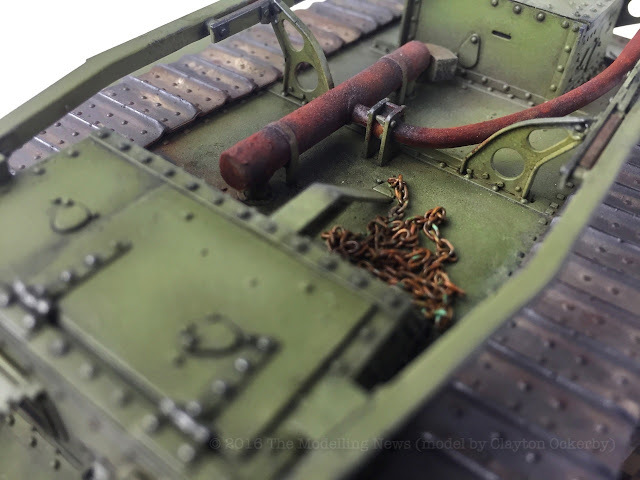 It all started with a dare - But how did it end? Some fine PE parts were then fitted to the model. In hindsight, I probably should have just stuck them on and then worked around them. 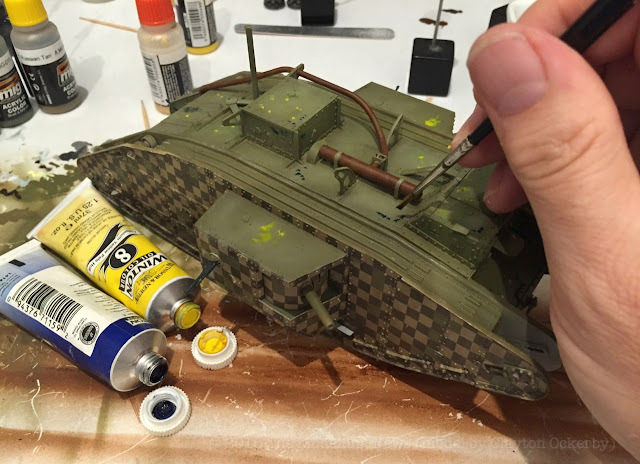 I did have a few issues with the primer not sticking to the metal parts. 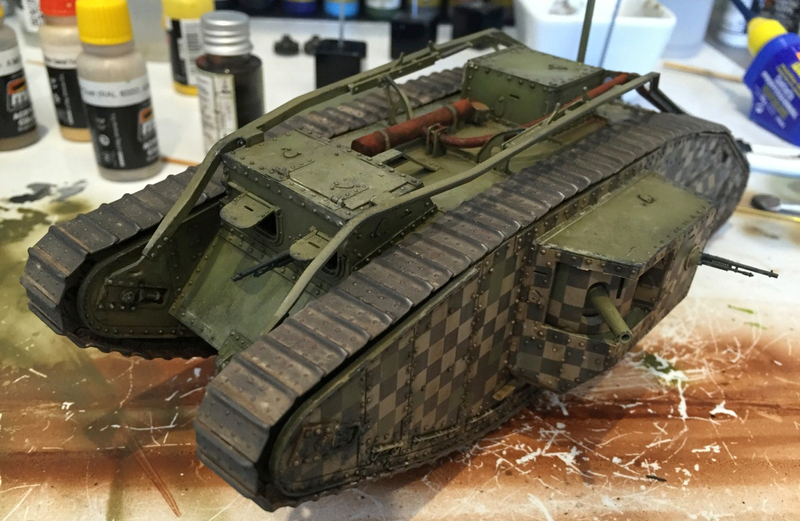 After stripping the first attempt paint, I lightly sanded the pieces and re-sprayed. This seemed to do the trick. 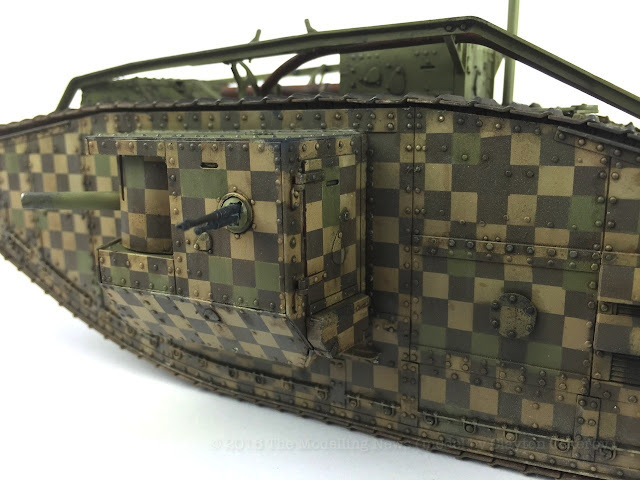 A combination of oil colours was then used to soften and blend the contrast of the check pattern on the side of the vehicle. 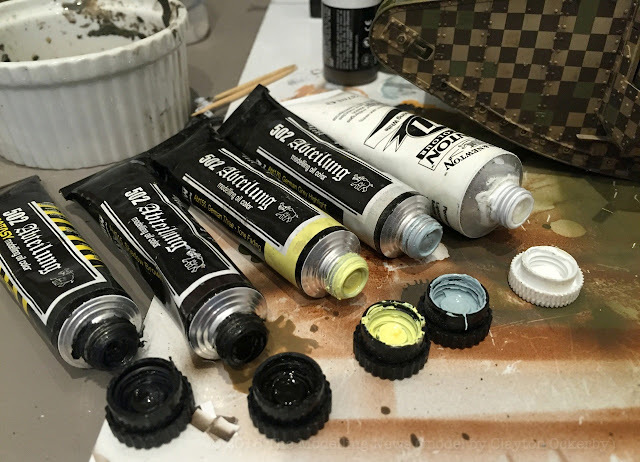 By applying small, random dots of the various colours, and then carefully blending them in with white spirit, a subtle but convincing look can be achieved. 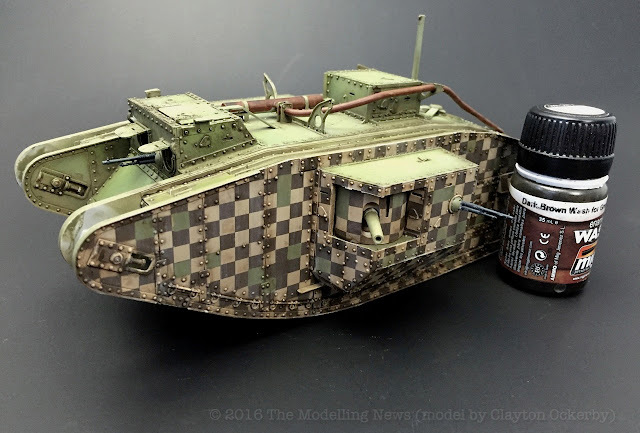 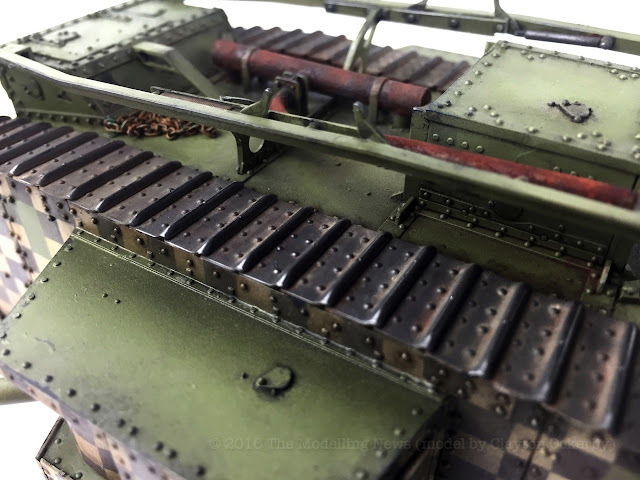 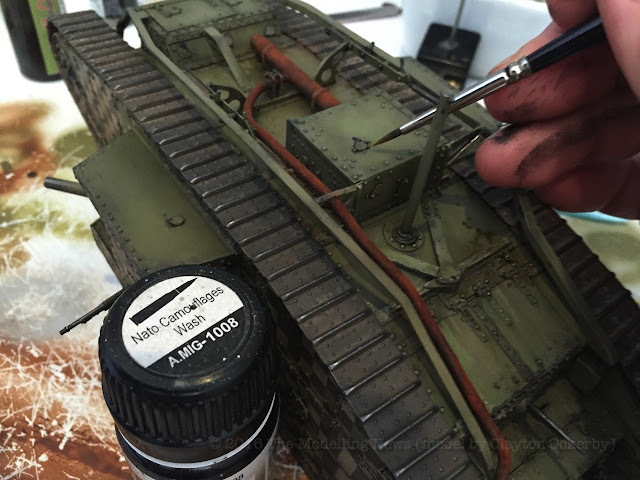 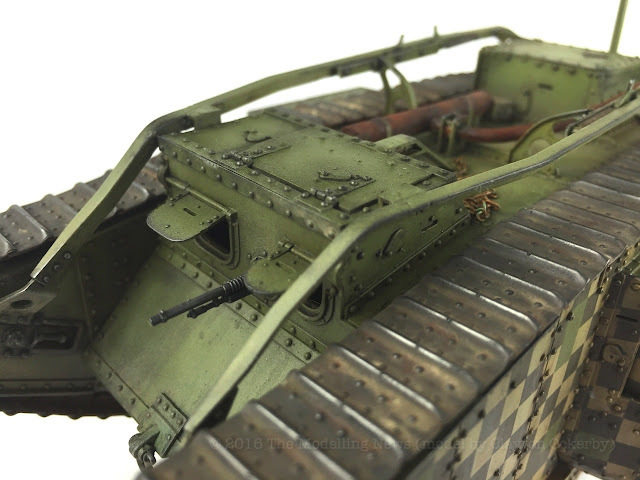 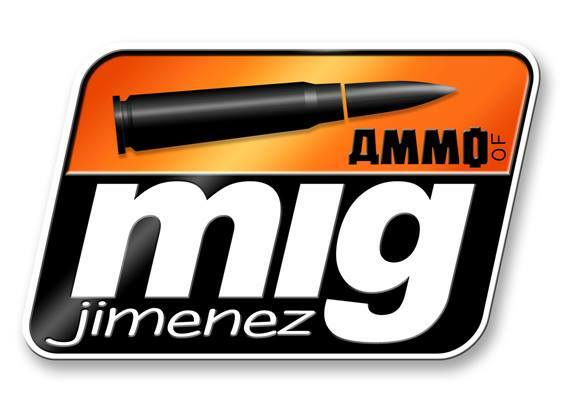 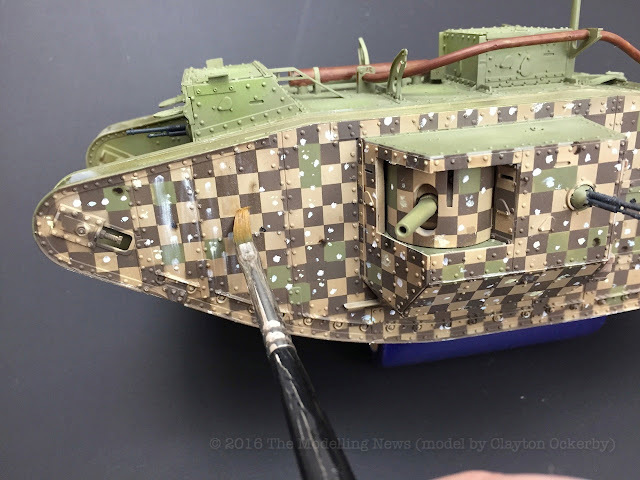 AMMO’s Brown wash for Green vehicles is now thinned and used as a wash on all of the rivets and recesses on the model. This elevates detail and brings the model to life. 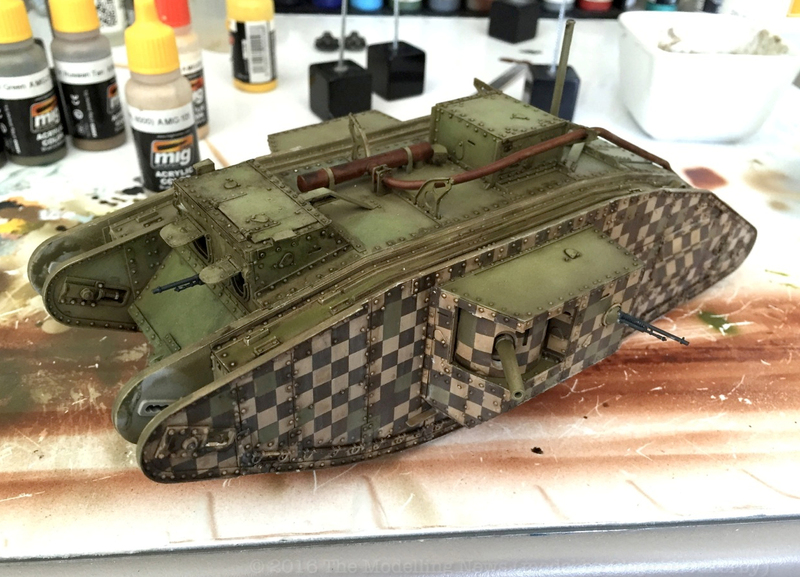 Some small chipping is now brush painted. 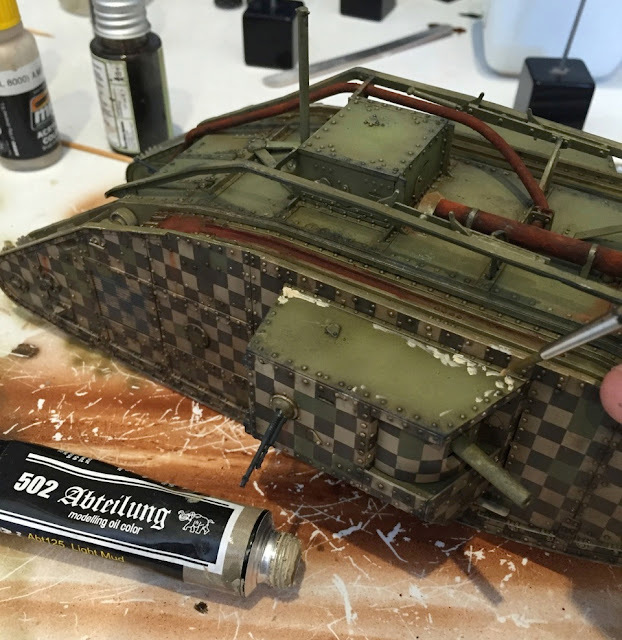 A lighter colour is initially painted and the darker chipping colour is overlaid. 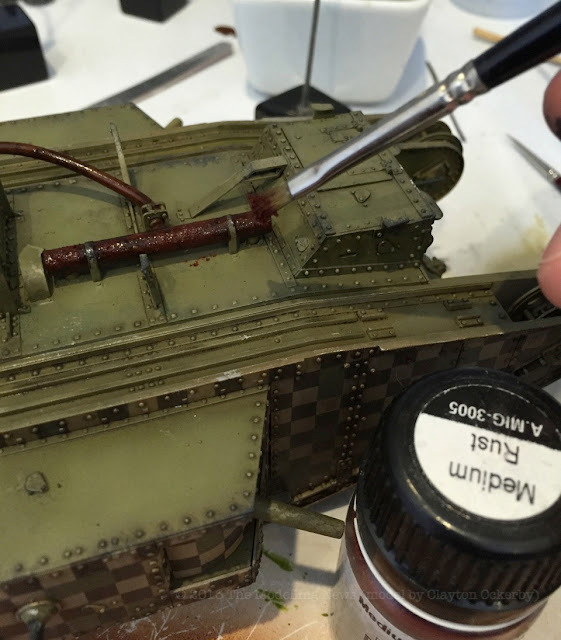 To refine that a little, the dark colour was then applied carefully by dabbing a paint covered sponge in the areas that needed wear. 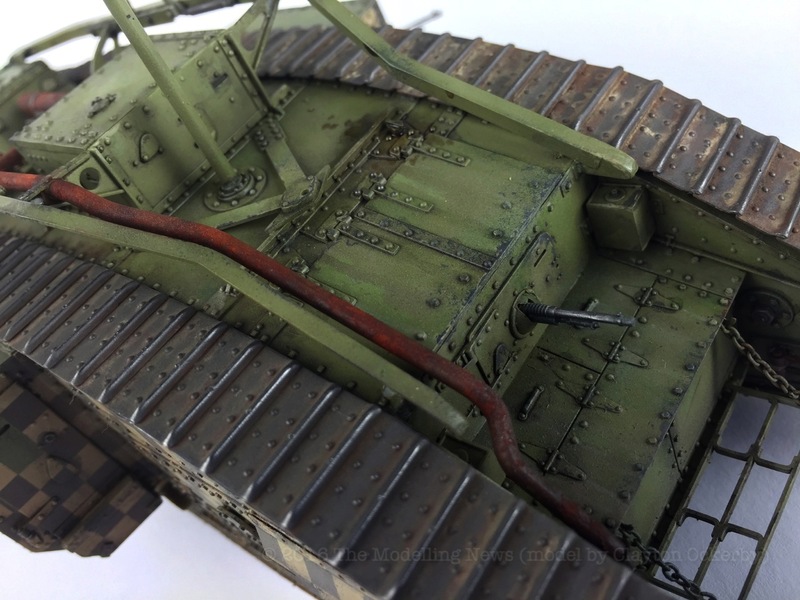 With the paint, I was wanting to keep the wear around service and crew hatches, and keep it to a minimum. 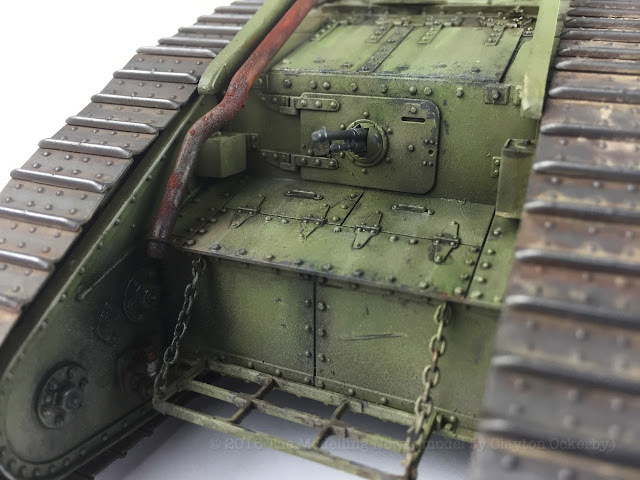 This actual tank had been in storage for some time and had seen no action, so I figured the chipping would be minimal. Rusty tones of pigment were now mixed with white spirit and applied to the exhaust pipe in a random manner. 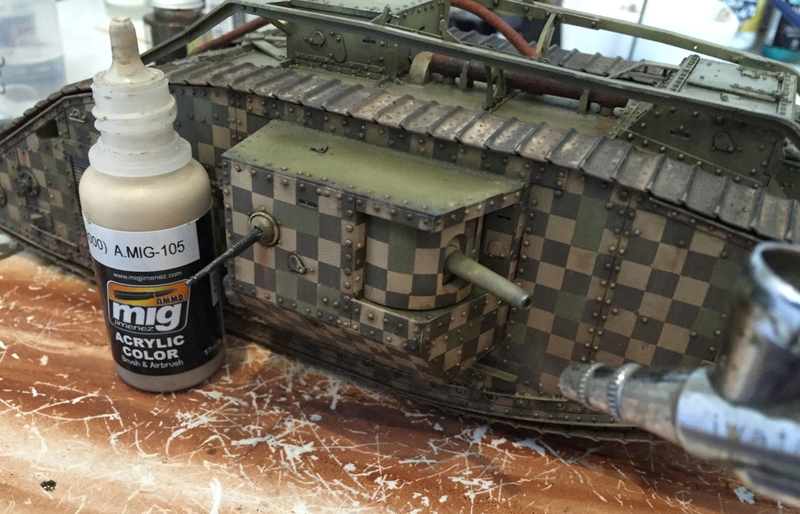 The pigment, when dry, will give an interesting texture and give the illusion of real rust. 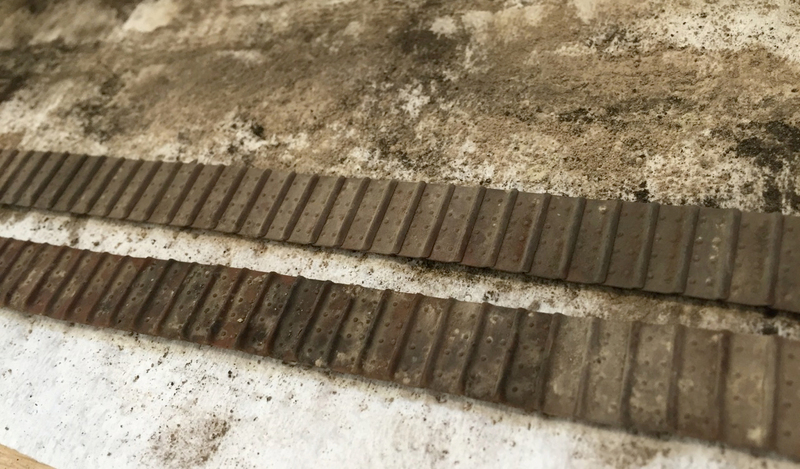 The tracks also received a wash using a thinned version of that mix. After the previous wash was allowed to dry, the tracks were laid out and treated to Europe Earth and Russian Earth pigment. 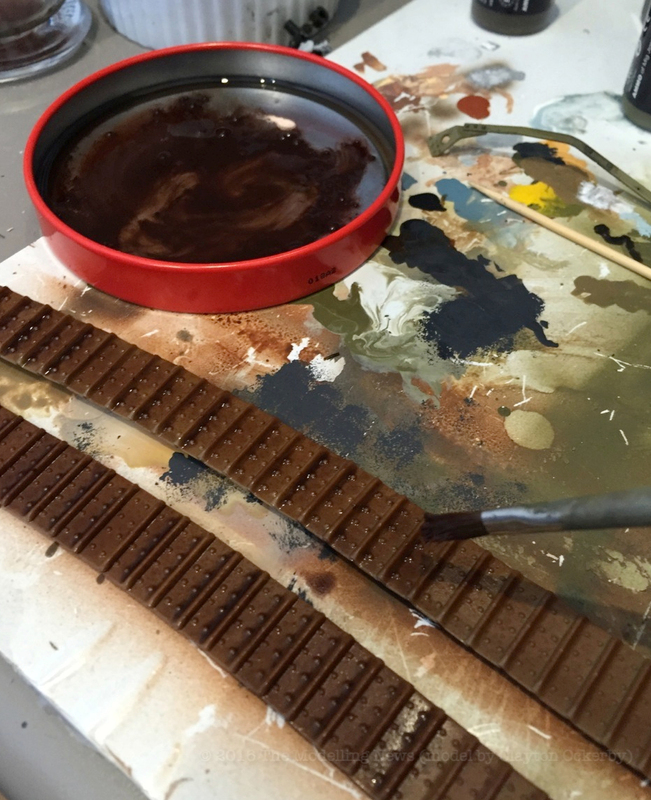 A brush was then soaked in white spirit and used to blend the pigments into the tracks. 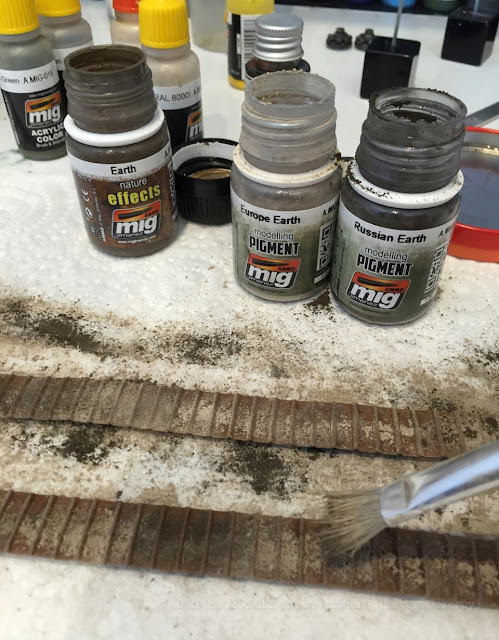 ‘Earth’ enamel paint was also heavily thinned and used to add different tones to the tracks. Once dry, the blend of pigment gives a pretty authentic finish. 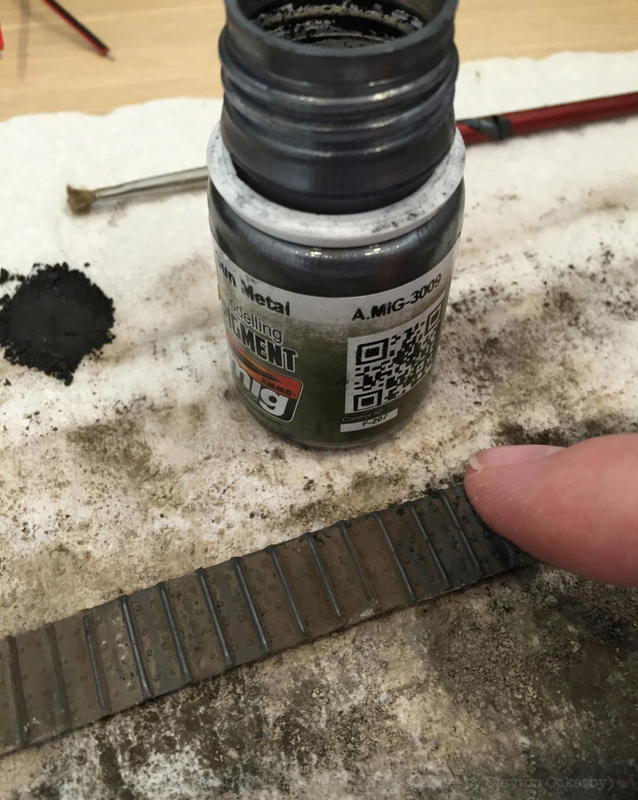 Using AMMO – Gun Metal pigment on the top of my finger, I now worked at buffing the high points of the track, producing a metallic finish to the tracks. 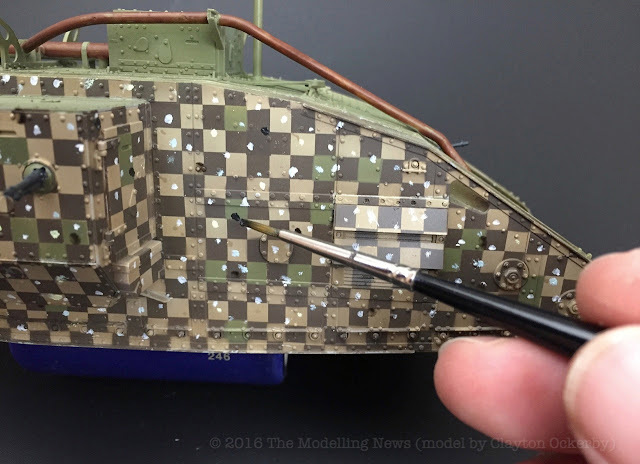 Small amount of Abteilung ‘Light Mud’ oil pint is now worked into the surface of the model using white spirit. 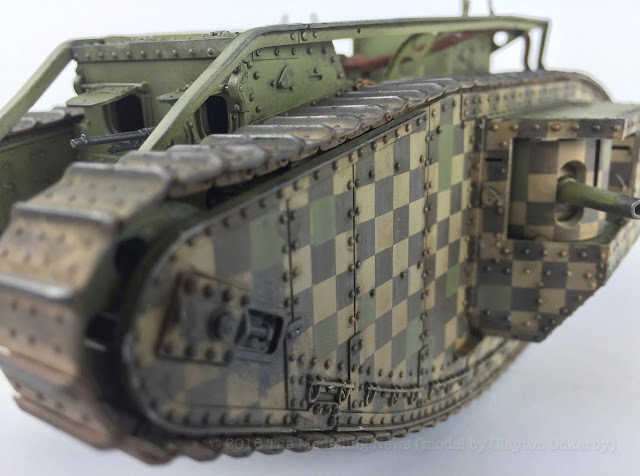 This will help with the lightly dusted look. 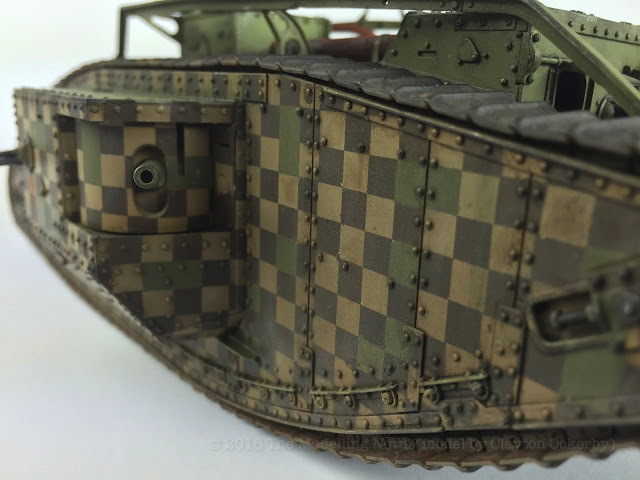 The effect is subtle but convincing. 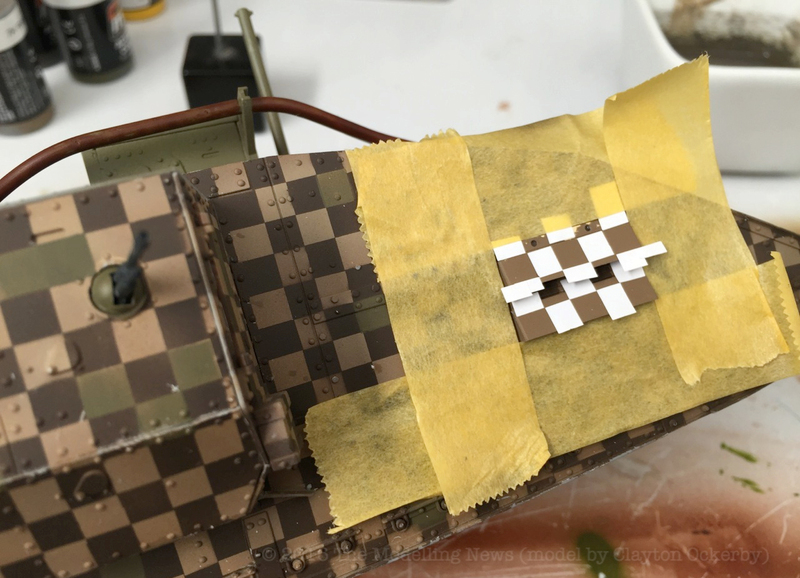 Some of the deeper recesses on the model now receive another line wash, this time using the darker toned ‘NATO Camouflages Wash – A.MIG 1008. 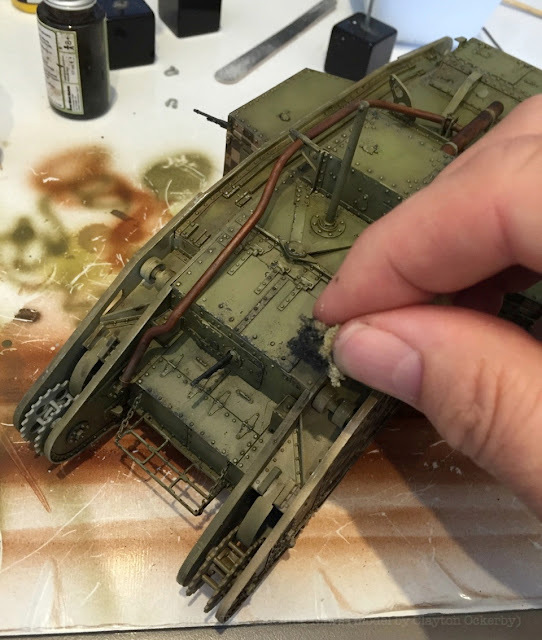 ‘Washable Dust’ is now lightly applied along the lower parts of the model as well as a very light dusting over many parts of the model. 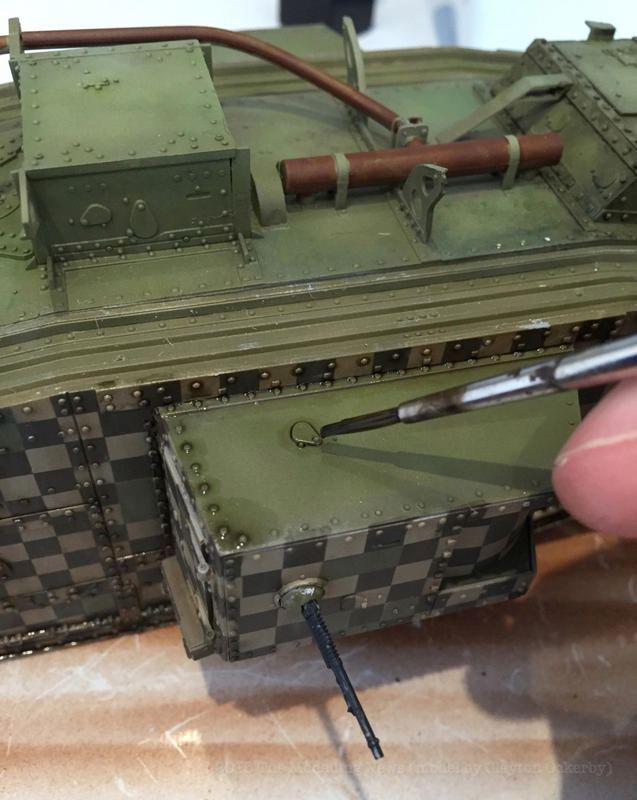 This will help tone the contrasts down and unify the paintwork. 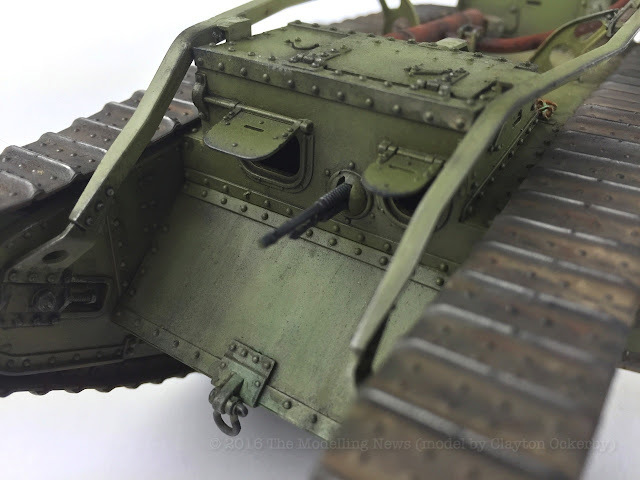 It will also help with the dusty, worn look. 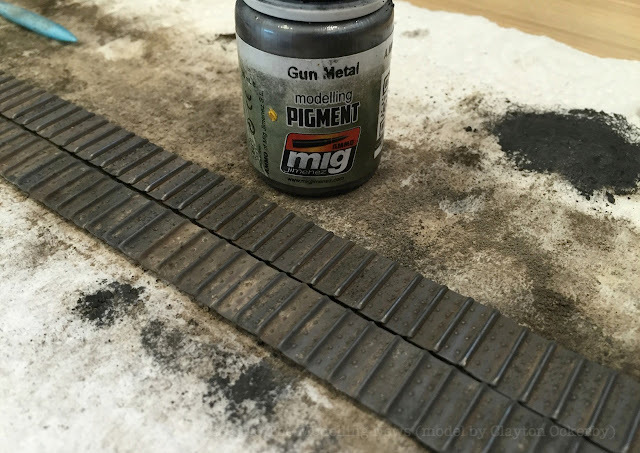 In addition to this step, but no pictured, Gunmetal pigment was again used to spark up the high points in the tracks as well as the machine guns and a few other select places around the model. For TAKOM, this rhomboid shaped tank is really nothing new. 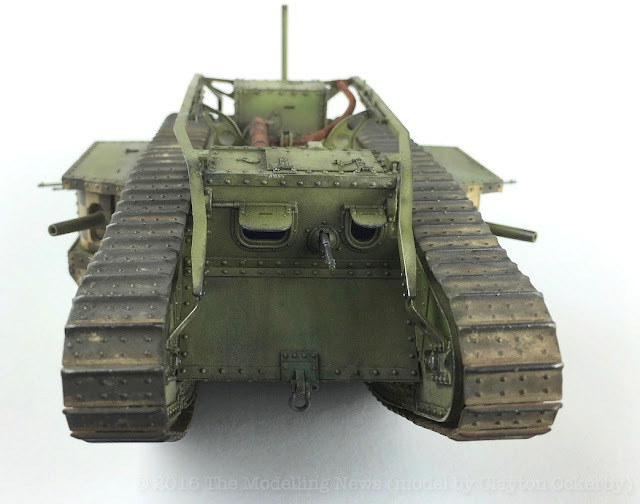 It is essentially a variation on the earlier releases of the Mk.IV’s. 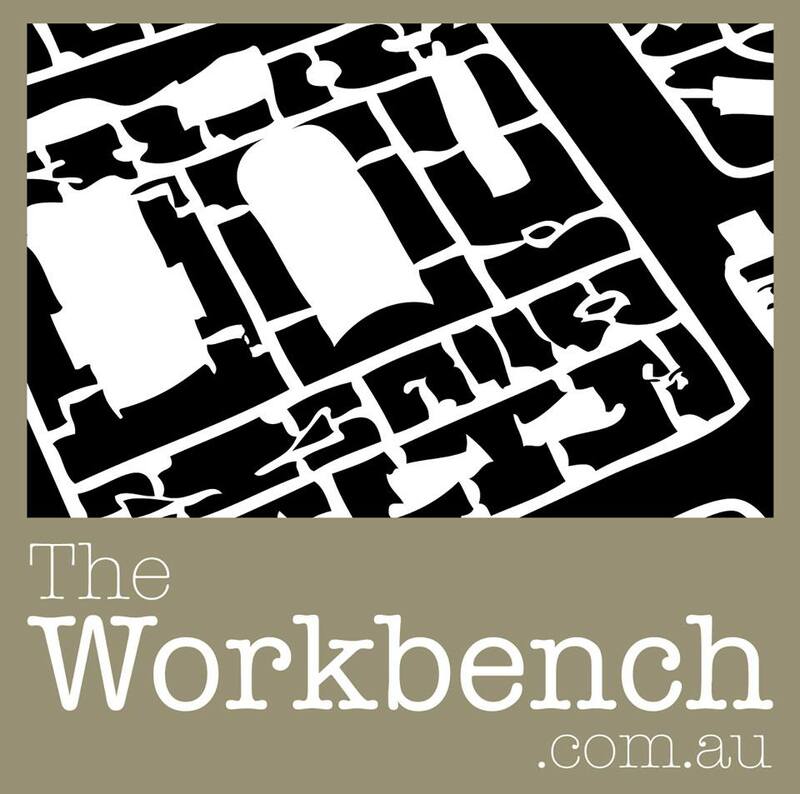 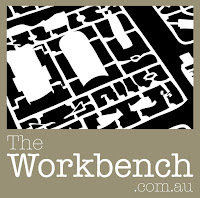 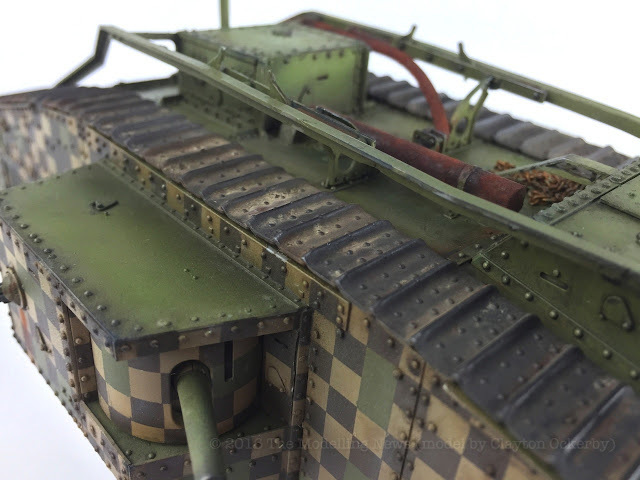 It is an easy, uncomplicated build with a good level of detail. 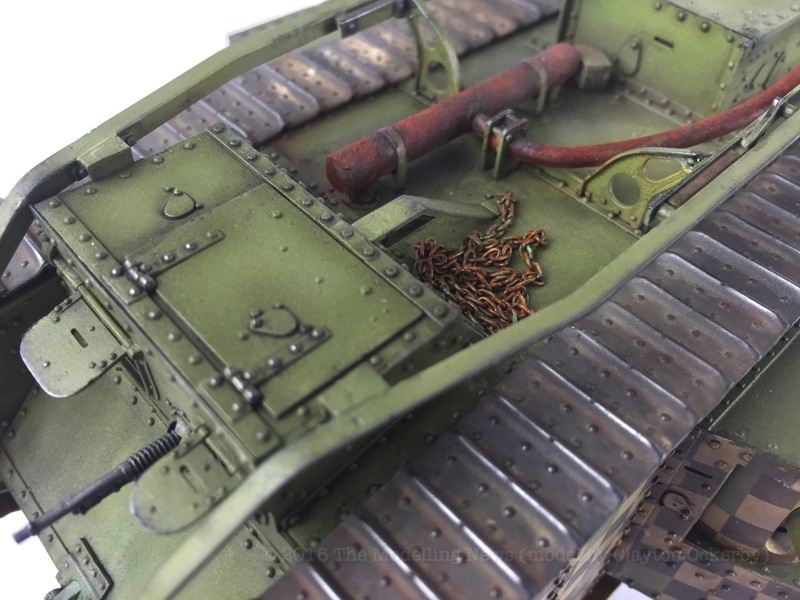 Perhaps the model could have been improved with a basic interior, engine bay or even just the ability to pose some of the pistol ports in the open position, but these are minor complaints. 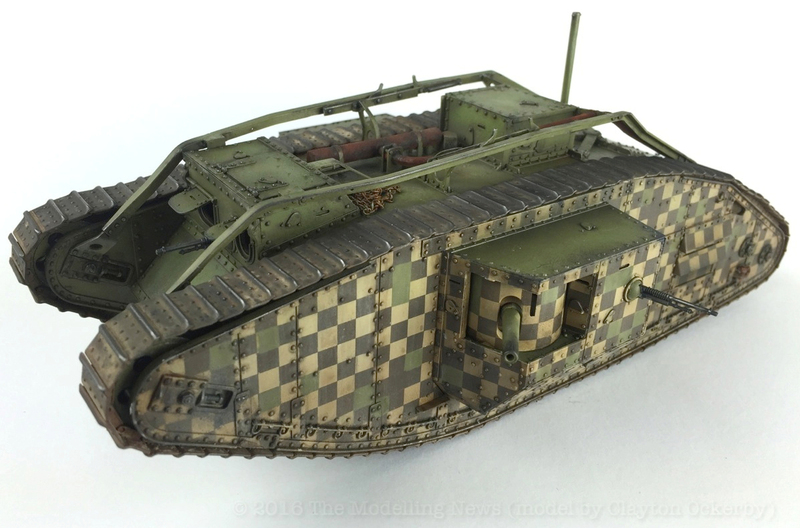 A positive with the kit is the fact you can build one of three variations. 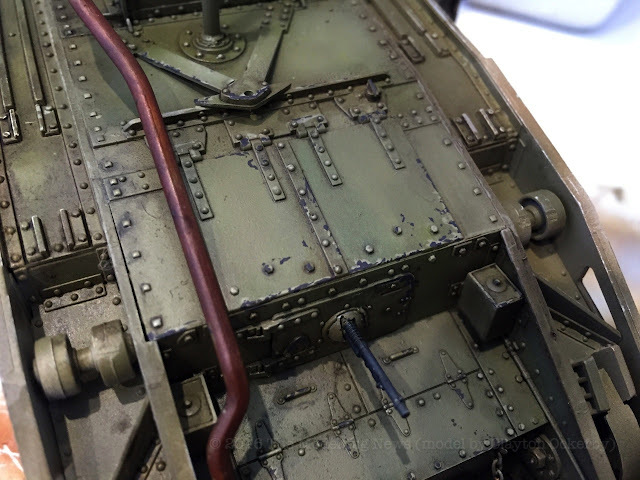 The Male, Female or the Hermaphrodite. 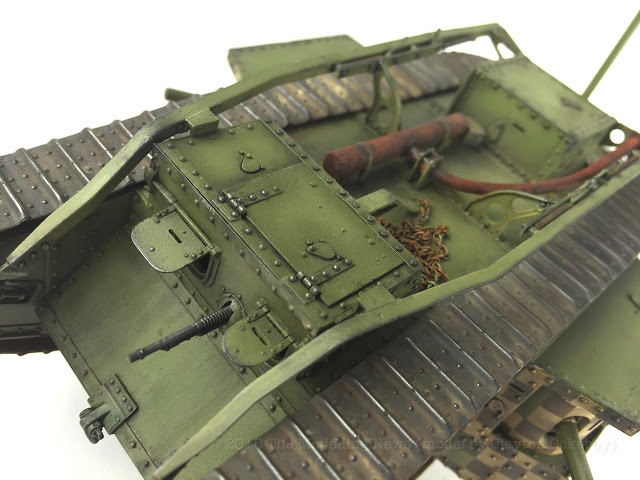 The easylink tracks also guarantee a great looking, workable track with a minimum of fuss with construction. 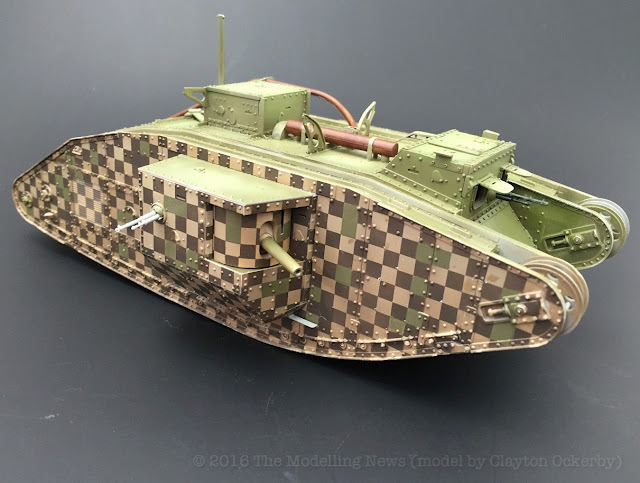 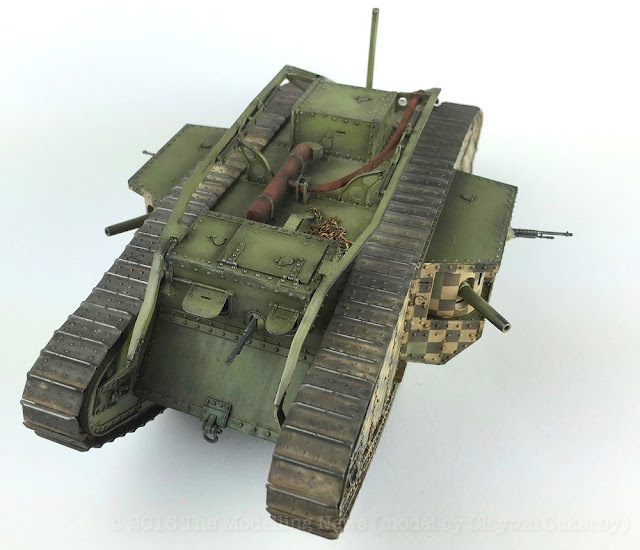 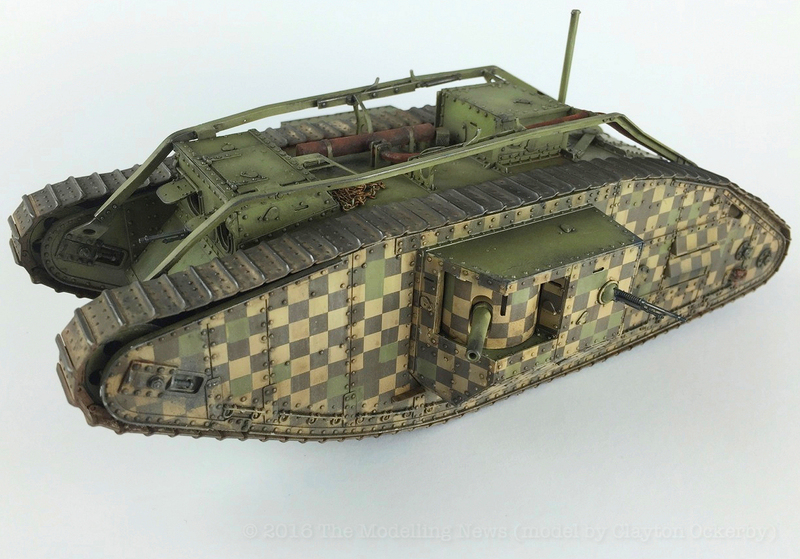 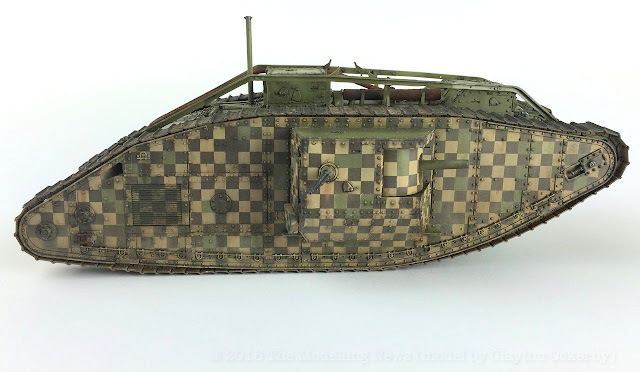 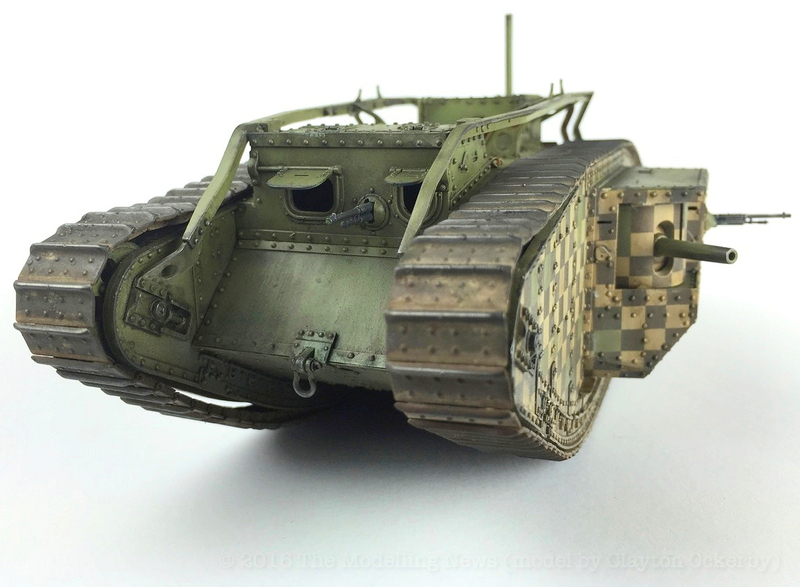 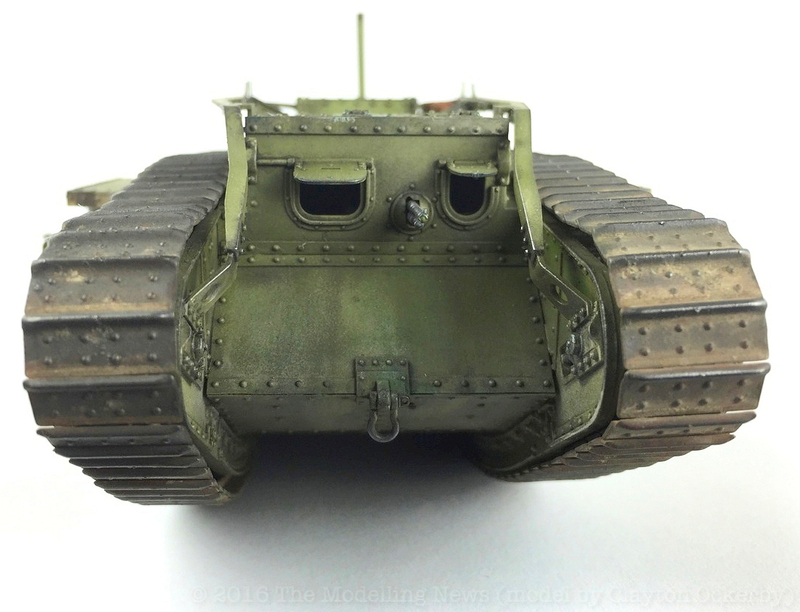 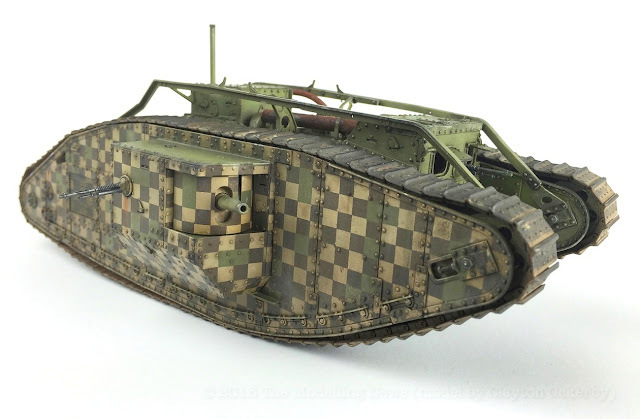 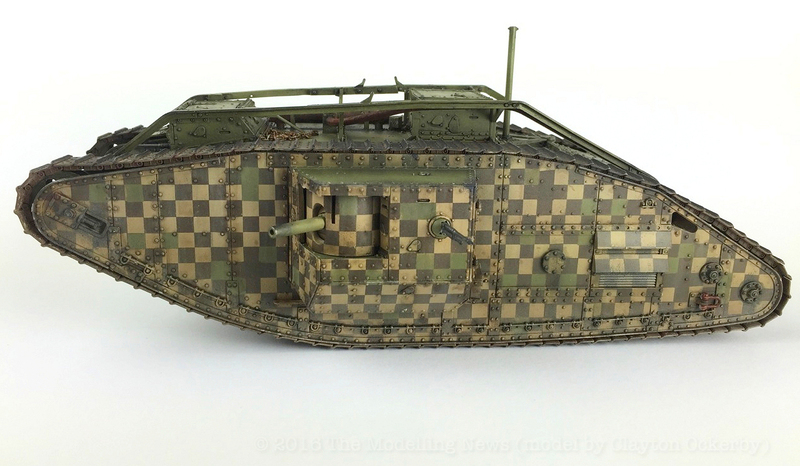 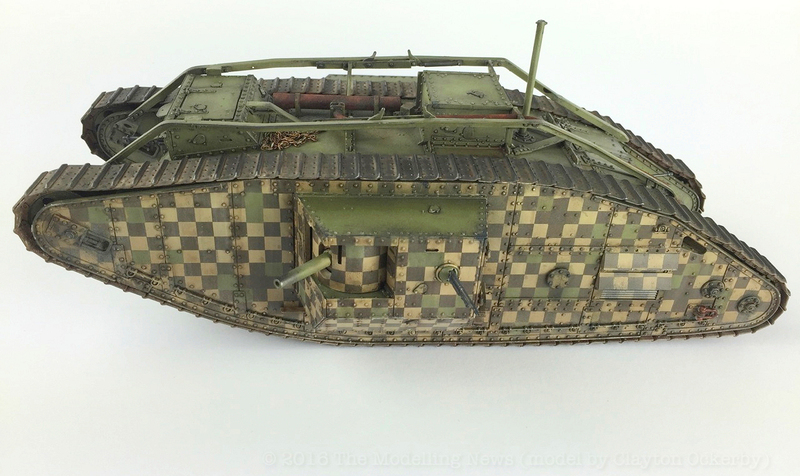 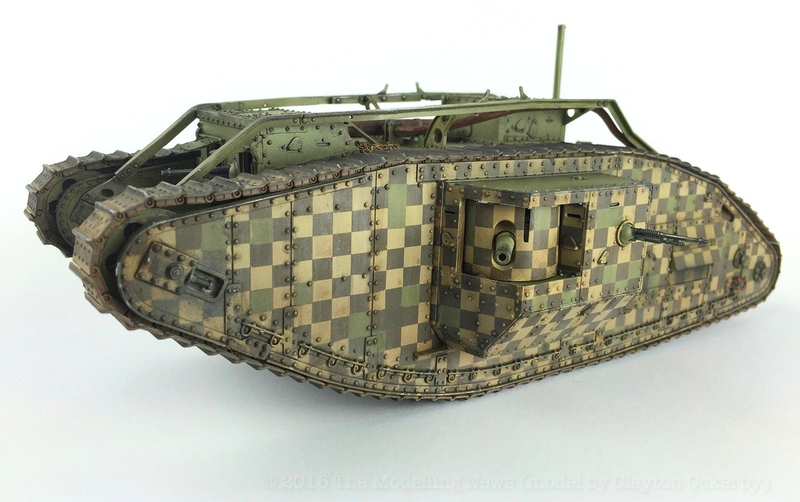 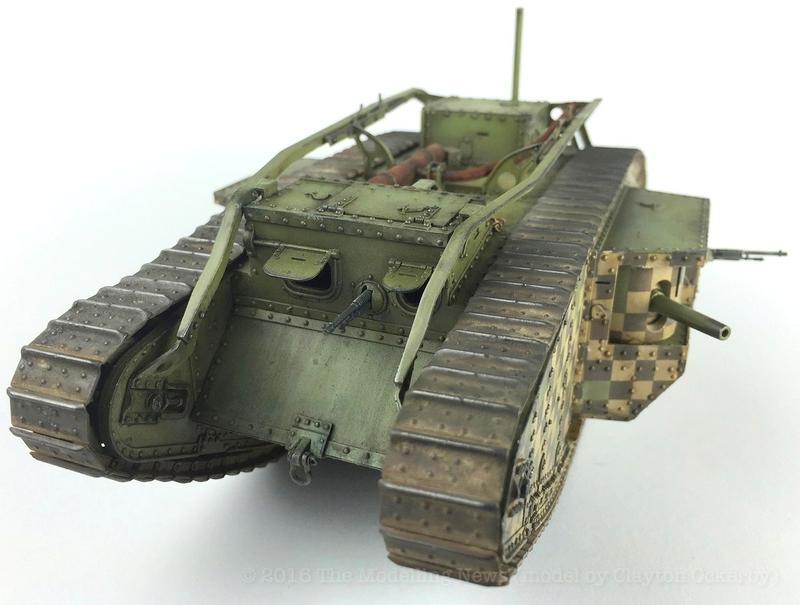 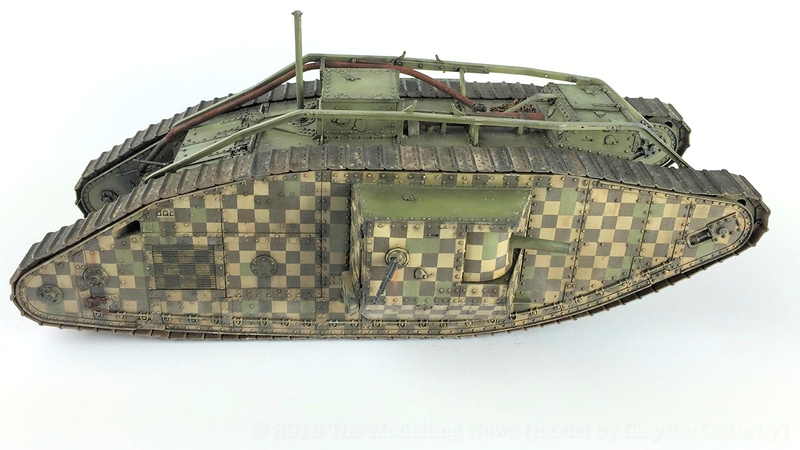 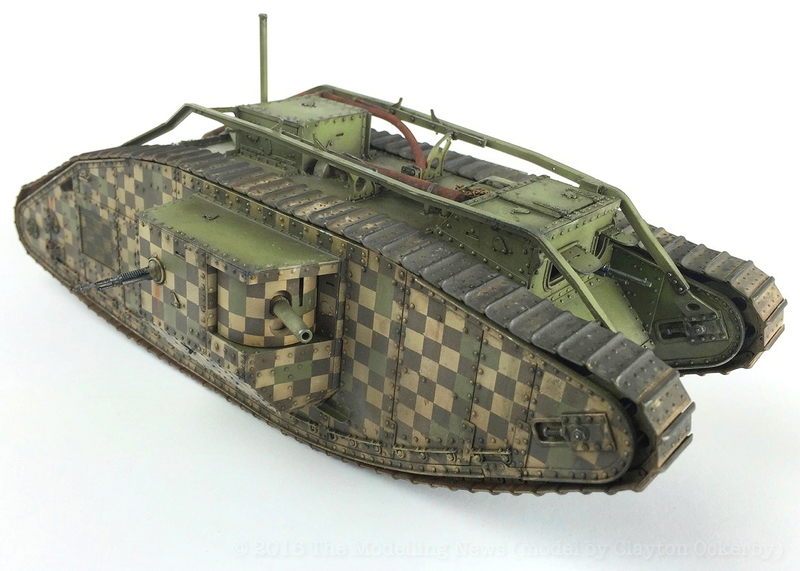 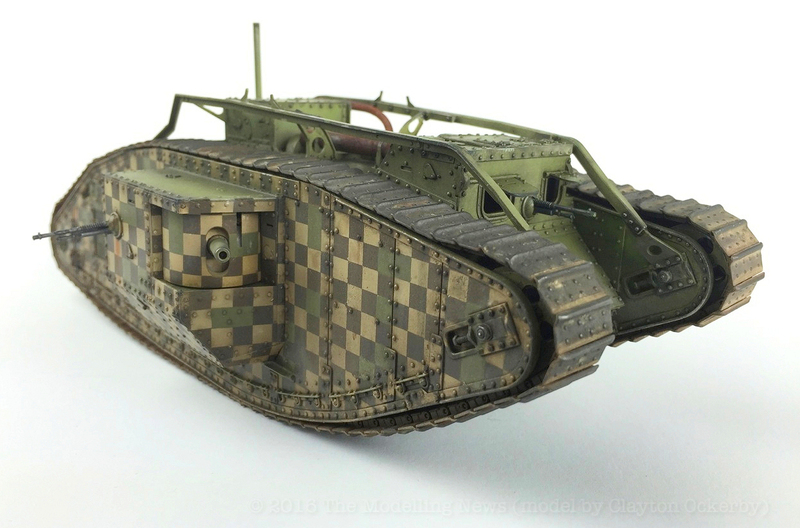 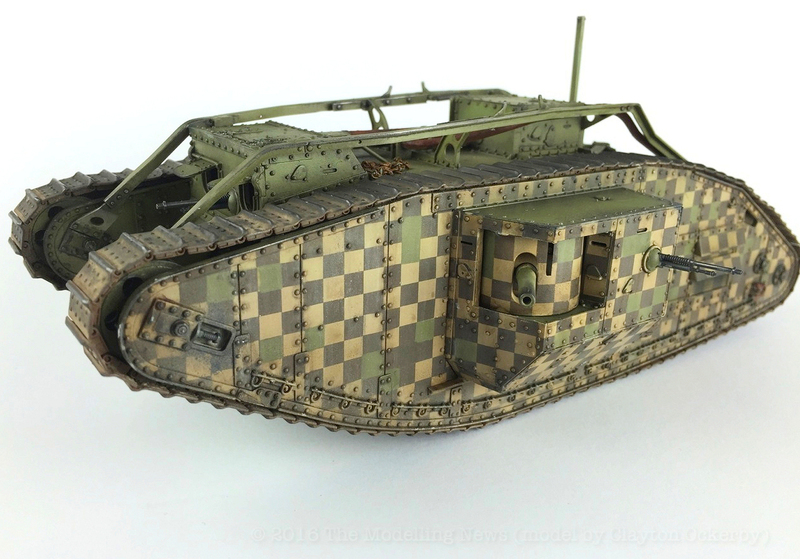 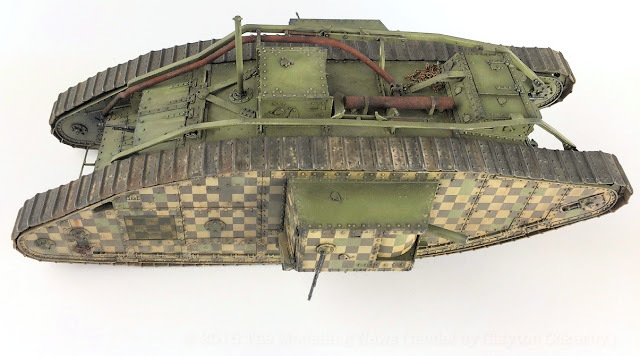 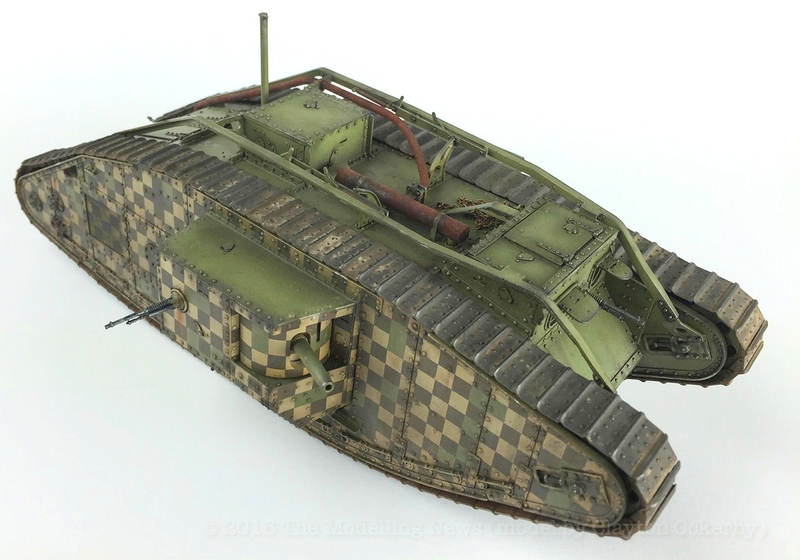 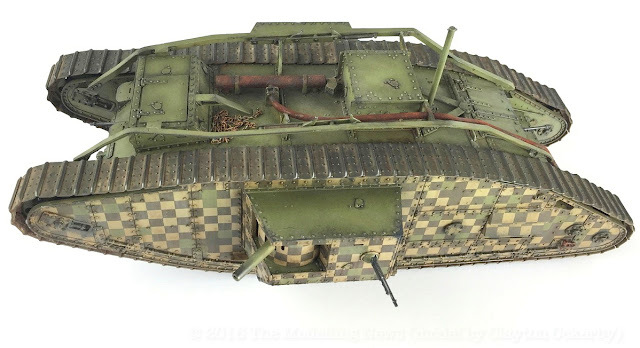 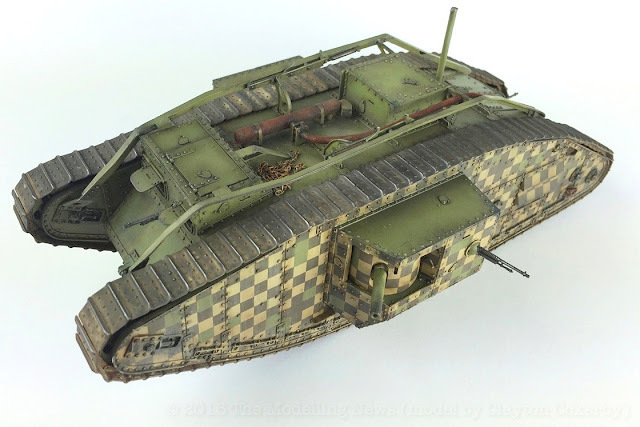 Obviously this model will appeal to the WW1 buffs, but given its appearance during the Second World War, there is no reason it shouldn’t be of interest to the WW2 fans out there too, or just someone looking for something a little different. So, for anyone even mildly interested in the subject, I strongly recommend the kit. It can be a really quick project, or if you are like me, you can make your life difficult and try and replicate a chessboard in 3D! 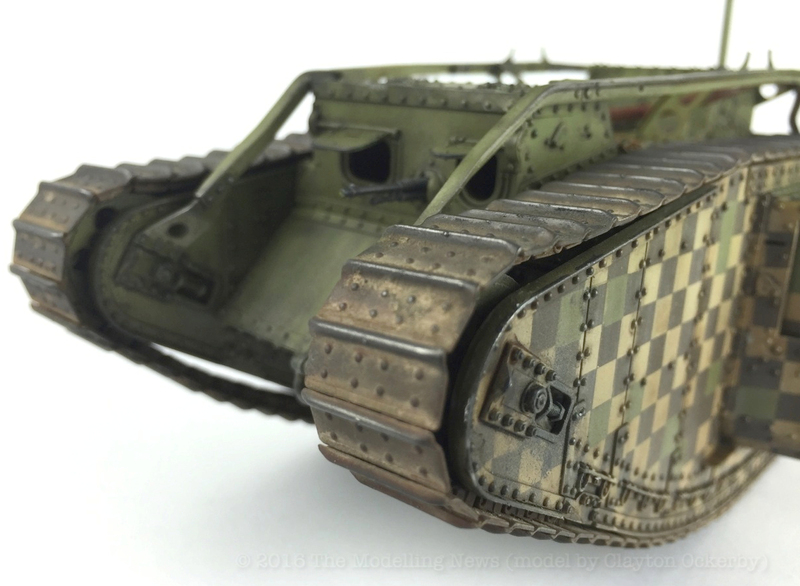 Thank you again to Takom for continuing to feed the hobby with new and interesting subjects that seem to have been relatively ignored in the past. 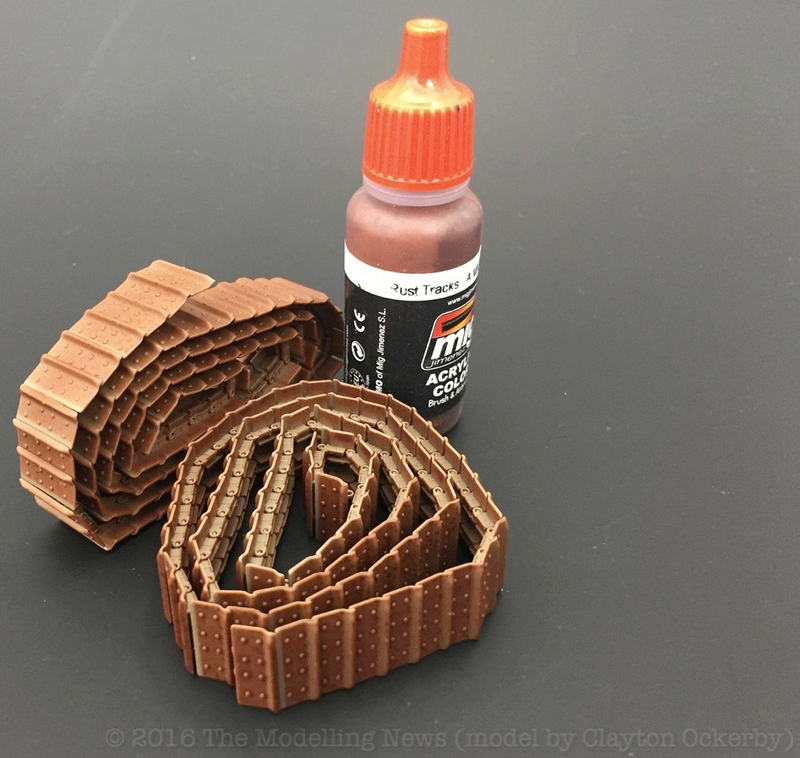 Thanks to Takom for sending this kit to Clayton to review and very soon make for you all to see how it all goes together. We will see part III in the next day’s news. 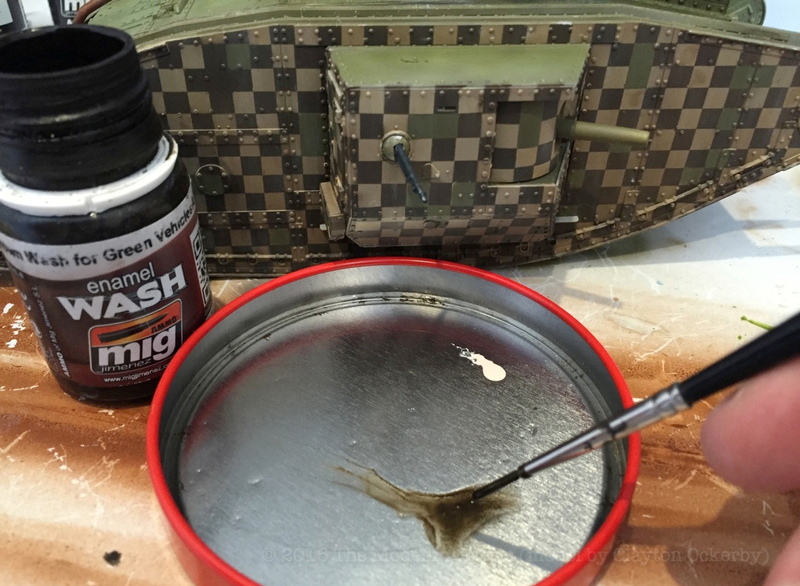 Also thanks to the kind peeps at AMMO for sending the paint & weathering materials for clayton’s schmick job!